The new Volvo S60, based heavily on the attractive and shapely Volvo S60 Concept, show the company is willing to update its image — just in time for their sale to China. One more photo below. "The all-new Volvo S60 is sculpted to move you. It looks and drives like no other Volvo before and the car's technology will help you to be safer and more confident behind the wheel," says Stephen Odell, President and CEO at Volvo Cars. The Volvo S60 can be equipped with Pedestrian Detection – a groundbreaking safety feature that can detect pedestrians in front of the car and brake automatically if the driver doesn't react in time. 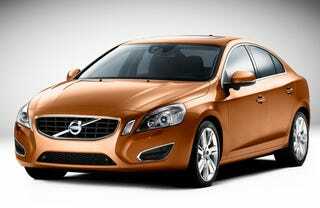 The all-new Volvo S60 will be unveiled at the Geneva Motor Show in the beginning of March next year. Production of the sporty saloon will start early summer 2010 at Volvo Cars' plant in Gent, Belgium. "The customers in this segment want emotional appeal, sporty design and dynamic driving properties. The S60 has it all. We are convinced that it will be one of the strongest contenders around," says Stephen Odell.